Can I let you into a little secret? I don’t use any of my meal planning printables. Crazy right?! The thing is, I used to use them faithfully. Not only did they help make sure I had something to put on the table each night, they really helped when it came time to do the grocery shopping. Truthfully, though, we hardly ever followed my plan, and then last year we discovered a local butcher who sells local meat in bulk packs. That changed things considerably. It forced me to start planning around what we already had and just like when any system changes, I just sort of stopped doing it for a while as I mulled over how to do it the best way for our family. In the end, I decided to stop planning my meals in the traditional sense and create my own system that better suits our lifestyle. I say it all the time; we need to create systems that work for us, not the other way around. My old way of planning my meals was a case of me working for the system. It was doing nothing to help simplify our lives and it was no longer really doing the job it was supposed to do. Eventually, I just gave up trying, and we sort of floated along without a system and I learned so much about how our family approaches meals. There were many reasons why our system stopped working, but I’ll spare you a novel and stick to the main points. we changed how we shopped, which meant that half the reason for planning my meals was no longer valid. we tend to choose our meals based on what we feel like for dinner. One of the boys might mention wanting pasta, or it might be rainy and cold out so a stew or roast appeals more than a chicken salad does. without a plan, we didn’t resort to take-out or dining out. To be sure there were nights when I was scrambling last minute, but we cook almost all of our meals at home, reserving eating out or getting take out for special occasions. There were more reasons it was no longer working, but these were the big ones. The last point was especially eye-opening. I learned a lot from stopping my meal planning and observing how our family really works in the kitchen. Even though traditional meal planning wasn’t working anymore, I quickly realized that I did need some sort of plan. Something to help balance out the different meats and make sure I had enough ingredients in the pantry and fridge to make well rounded, wholesome meals from. So, if I don’t plan my meals, what do I do? Well, it all started when I stopped planning and started watching. Specifically, watching my husband work his magic in the kitchen was the big eye-opener. You see, I used to follow recipes all the time, some were actual recipes and others were more like my own standard way of cooking things. Over the years, I’ve picked up a lot of tricks from my husband who only uses recipes for certain things. The rest of the time he just tosses stuff together and turns out these amazingly yummy meals. While I don’t quite have his talent, I’ve noticed that I’ve started doing that a lot more myself, and our teen is doing the same thing. So how do you plan meals when no-one actually uses a recipe? I’ll show you. For dinners, I use this little printable I made. While I’m no longer planning out two weeks of specific meals, I do still need to plan for those meals. Because we order our meat is large packs from the butcher, I needed something that would allow me to make note of what we have, and also let me plan for items that may not come in the pack we chose, such as fish, poultry, and eggs and other alternatives. I have a good general idea of what we usually pair with what. So here is where I note down the grains and starches we usually use, such as pasta, rices, potatoes, tortillas, buns/breads and so on. I like to make sure we have veggies with every meal. This is column is where I keep track of what we might need, and it also helps me make sure I purchase enough when we do our shopping. So say I have ground beef, followed by tortillas, in the veggie column I might add peppers and salad fixings. Each line usually ends up with two options on it. This is the fun column, it’s where I note down anything we might need that doesn’t fit the other categories. Salad dressing, salsa, sour cream, certain spices, vinegar, other sauces or ingredients that we might need. This has been working really well for us. It makes sure that we always have items on hand that we need. I can take a quick peek in our pantry, fridge, and freezer while making the shopping list and make sure we’re not buying duplicate items, especially perishables that might not get used before they go bad. For everything else, I use a second planner printable. Again, I just simply jot down ideas for what we normally use for breakfast, lunch, snacks, and extras. I track things like baking ingredients, juice, and other items that don’t fit any of the other categories. This way I have a good idea of what I’m going to need for the following few weeks. This system has been working fairly well for us. Whoever is cooking that night decides what they’re making in the morning and makes sure they pull out anything that needs to be thawed. If we plan on making something specific, like when my hubby makes a giant pot of borscht, I jot that down on our family calendar and make sure the ingredients needed get added to our shopping list. Meals like that become almost like special events for the kids. All in all, it’s been really nice not planning my meals every two weeks, and I know, for our family anyway, this system has been nothing but great. I’m still making sure we have what we need, without confining us to the same dishes over and over again. Next on my list for meal planning, is to start planning on trying one new recipe per month. I’m thinking it might be fun to try choosing a different country and maybe working in some learning into dinner. We’ll see. In the meantime, I’m just going to keep on as we have been going. planning my meals every two weeks, and I know, for our family anyway, this system has been nothing but great. How do you plan your meals? Any tips or tricks you’d like to share? Any questions you have about meal planning? Drop me a line in the comments, I’d love to hear your take! Previous Post: « Weekly To-Do List Printables – and an AWESOME New Bundle. I love this! 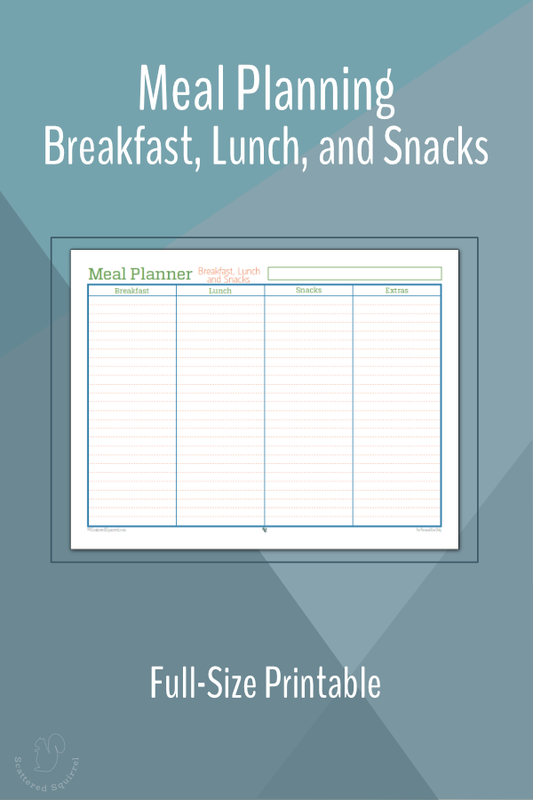 I currently use your weekly meal planning printable. I’ve been doing pretty good with it and noticed I am not buying too much of anything (so Im saving money! yay!). However, I do what you are currently doing, I plan my meals according to what meats/proteins that are on sale for the current week to plan out next weeks meals. I think its the perfect combo for me! I am going to try out todays new printable for the next few weeks to see if this may work better for me, thanks! This is how I wish I could meal plan! While I do have a list of things we eat on a regular basis, it’s quite limited and there are too many times where we just get listless with it – nothing will sound good…and then we’ll eat a lot of fast food! The past month has had us without a meal plan, and it hasn’t been going so well. But, half that battle is lack of motivation, and the other half is lack of caring – neither of us really care *what* we eat a lot of the time, we just don’t want to figure it out! I use a similar form to list what is on hand; and use it, along with the weekly grocery ads, to plan meals using your Weekly Meal Plan form. I have changed the Weekly Meal Plan form by omitting the days of the week, so that the form becomes a list of meal options for the week, to be chosen as time/weather/mood allow. My inventory form has 5 columns: Protein/Legumes; Vegetables/Salad Items; Cereals/Grains/Breads; Fruit/Dessert; and Soups,/Sides/Beverages/Extras. I list the items with the date purchased and location (example: 1 tilapia fillet Feb. 5 RF ) RF=refrig. freezer; DF = downstairs freezer. It’s very easy to update, as a Word computer document. My system helps me use items in a timely manner. I easily see what’s missing, if I want to make a particular dish (no tortillas in the freezer, so I need to put them on the shopping list, for the taco dinner) . I’m 75 years young and frisky, and am living solo on a pension; so food and money management for optimum health ( both physical and financial) is important to me. My meal planning consists of only determining what we want for dinner. Breakfast and lunch are a no brainer because we stick close to the same things all the time. I do two things before I start planning. I check both of our freezers an the local ads. I have been cooking for over 50 years, so recipes are only needed now and then. We do have dietary restrictions, but we know what they are and how to deal with them. The rest is pretty much done the way you do your planning. When I break out the menu planner, I am pretty much using it as an Inventory control system. We eat much lighter than we used to when I was learning how to cook. There are only three of us living here now. We buy less and we make less so we waste less. Once monthly, I check on what I refer to as our “staples’ such as seasonings, broths, and such. I buy what I will be needing, but will often buy extra “starters’ for sauces and such. We enjoy ad lib cooking. Since we know what we can and cannot have, it isn’t a problem. We only buy what we are going to use. I do have a local butcher from whom I can pre-order my meats and poultry items. I visit him once a month to pick up my order because I can email the order to him and he will email with a pickup date and time. Hubby and I go shopping with three coolers in the car so we do not have to worry about things wilting or getting soft before we get them home. Planning meals down to the minute details is crazy making. I never did that before we retired and I refused to do that after we retired. Yes, I a spoiled. My husband is, too. I’m new to your site. Found it through facebook. I love this idea of planning. I have such a hard time meal planning. My husband loves to cook too. And we live with my in-laws so sometimes my mother-in-law will buy things that weren’t in my plan (I’m not complaining!!). Those things make it difficult to always follow a plan and most of the time I lack the “want to” to make a plan. I’ve spent some time looking around your site…I love the printables!!!! I’ve had some of the same problems. I used to plan the week all out and then as soon as one day would change it waiting all get thrown out the window. I’ve realized that I need an undated method. Thank you for these printables. Do you think you could do the same idea with a boxed chat instead of lined columns? I’m thinking of I can check them off or cross a box out I’ll be able to better see what I have left for options. Just an idea. 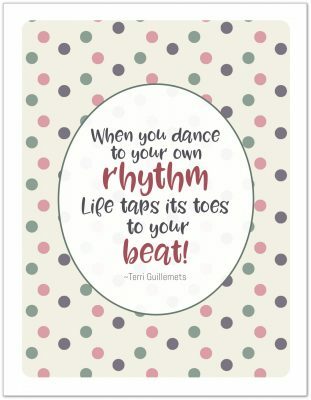 🙂 I love your printables and am so grateful for the work you do! They may not be as pretty as Alli’s (I know mine aren’t! ), but if you have access to a spreadsheet program (like Microsoft Excel), You can put together a totally customized template that meets exactly what you need. 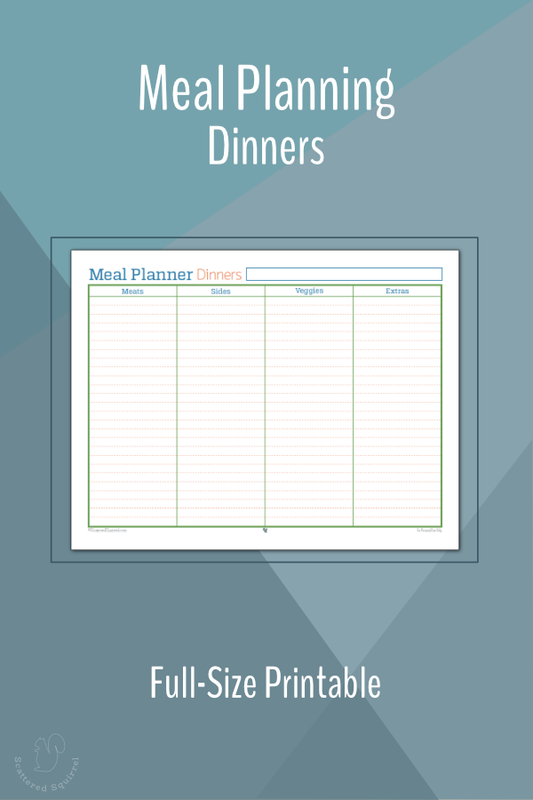 Just print out a new page each week and jot down your meals. I use Pinterest to get ideas for templates, and build my own based on what I liked from the ones I pinned. Full page 8.5X11 templates are easiest, but over time, I figured out page sizing (to print on 8.5X11 paper, while allowing for three sides of margins and one to punch holes) so that I can print out pages, cut them in half, punch holes and add to my A5 planner. Hi, Alli! I’m with you on this, intricately planning meals hasn’t worked for me, either. Both my husband and I work full time and have no kids. I tend to cook most of my weeknight meals on the weekend (things that take too long to make on a weeknight, like roasts, stew, meatloaf, stuffed peppers, etc). But there are meals I make that I make ‘live’ on the evening we eat it (spaghetti, fajitas, tacos, eggs/sausage/pancakes, grilled meats/poultry/fish, etc). Our local grocery sales fliers begin on Thursdays, so by Wednesday, I list 4-5 unique meals for the next week so I can shop Thursday or Friday after work for anything I need. For some of the meals I make on the weekend, I make a double batch (or triple if it’s something that hubby wants to take for lunches), So, if I make pot roast in the crockpot Saturday, we’ll have half for dinner Saturday evening, and as leftovers one night during the week. To sum, I make a list 4-5 meals based on what I already have and what’s on sale, when to make it (weekend/weeknight), and note the cooking method (so I don’t plan to make 3 crockpot meals on Sunday, b/c I only have two big crockpots, or if I want to make something in the oven, I might as well plan for multiple oven meals, so I’m making total use of the oven!). Hope this helps someone! I found this through pinterest. Love this article. I can’t stand meal planning. I rather plan meals based on what I have and shop each week to replenish my pantry supplies and sales. My issue is without meal planning I fall into a rut of same meals each week. How do we prevent that from happening?? Hi Holly, I’m so happy you found us. I try to avoid the rut by planning for different ingredients, like using ground beef in spaghetti sauce one week and in tacos the next. I try to sort of change things up on the fly too if I realize we’ve had the same thing a lot lately. I do Menu Planning the Lazy Way. List Top 12 Meals. Consult Cookbooks for List of Ingredients. Choose a few meals for sometime that week, make a list of what I don’t have and shop accordingly. That is all. That sounds like a great way to meal plan. I love the idea of having a list of your top meals to refer to. That must make it so easy to maintain.